Most days of the week you can find Jackson Reber driving the Oklahoma City Thunder, Rolling Thunder Book Bus. The book bus is designed to promote reading and literacy across the state. Jackson visits schools and organizations passing out free books to those who participate. In Jackson’s free time he volunteers at The Children’s Center Rehabilitation Hospital as a patient companion. He provides companionship, entertainment and comfort to patients at bedside. Jackson was born and raised in Oklahoma City, graduating from Putnam City North High School. He graduated from college with a degree in Strategic Communication. While in college Jackson began an internship for the OKC Thunder, mostly working games at Chesapeake Arena. After graduating he was hired as the community relations coordinator for the OKC Thunder. “I love to use basketball as a way of making a positive impact on people’s lives. I grew up playing the game and learned so much about life through it. Basketball can be such a beneficial teaching tool for kids. I want to help them grow through the game of basketball,” said Reber. In October of 2017, Jackson came to the Hospital for a scheduled Rolling Thunder Book Bus visit. Jackson had never been to the Hospital and was moved to become a volunteer by the patient interaction he experienced. Taelynn and Stephanie pick out a book from the book bus. “I met a patient at the Hospital who loved to read. I had a great time talking to them about books and making recommendations. 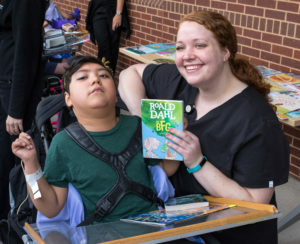 I mentioned I wished I could come back to hang out with this patient and talk about books. Hospital staff suggested I volunteer. My first thought was it was too good to be true. What kind of volunteer work involves just hanging out with patients and reading?” said Reber. Jackson grew up understanding the importance of helping others. His father regularly gave his children money at Christmas to give to those in need. This act of kindness laid the foundation for Jackson’s giving heart. Jackson has witnessed miracles while volunteering at the Hospital. He understands the importance of interactions and how it is part of the holistic approach to healing. Patients at the Hospital have benefited from Jackson’s companionship. His selfless actions are what make volunteers at the Hospital a vital resource. Jackson wants to tell anyone looking for volunteer opportunities or ways to give back to learn more about the Hospital. “I would tell anyone looking to volunteer to go to www.miracleshappenhere.org, read some of the stories on the blog or social media celebrating a patient leaving the Hospital with their families. You can witness first-hand the miracles happening there and you should jump on the opportunity to be part of it,” said Reber. For more information on the Hospital or ways to volunteer, please click here.